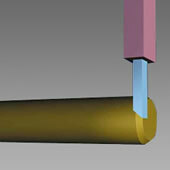 Precision ends are often the solution to many nagging problems associated with processing straight-length bar and tube. Fewer machine delays, hang-ups, collet damage and better material utilization are just a few of the problems chamfered ends can resolve. BPC utilizes a number of chamfer/cutoff machines to provide precision square ends with a full machine chamfer if desired.